Employees presented chief executive Satya Nadella with a petition signed by more than 300,000 people that called on the software maker to cancel its contract with the Immigration and Customs Enforcement agency. Microsoft employees questioned the company’s chief executive, Satya Nadella, on Thursday, presenting him with a petition signed by more than 300,000 people that called on the software maker to cancel its contract with the Immigration and Customs Enforcement agency, according to two people who attended the event. Nadella was attending an annual gathering with interns at Microsoft’s headquarters in Redmond, when the employees used the question-and-answer session to ask about the company’s government contracts, said the people, who declined to be identified for fear of retaliation. One employee presented Nadella with a USB stick that contained the petition, along with the signatures, including 500 from Microsoft employees, they said. The presentation of the petition is the latest example of employee activism at large tech companies against the Trump administration’s zero-tolerance policy on immigration, which had resulted in children being separated from their migrant parents this year. The White House has backed down from the policy, but the administration has struggled in recent weeks to reunite children with their families. Workers at several Silicon Valley companies were up in arms over the issue, but Microsoft came under particular scrutiny from its employees because the company has a contract for processing data and artificial intelligence capabilities with ICE. The agency had been separating migrant parents and their children at the border with Mexico. Last month, Microsoft employees circulated a letter that called on their employer to cancel all contracts with ICE, among other measures. In response, Microsoft said last month that to the best of its knowledge, its products and services were not being used by federal agencies to separate children from their families at the border. It added that it was “dismayed” by the Trump administration’s immigration policy and urged that it be changed. The scrutiny comes as Microsoft has been positioning itself as a moral leader of the technology industry. 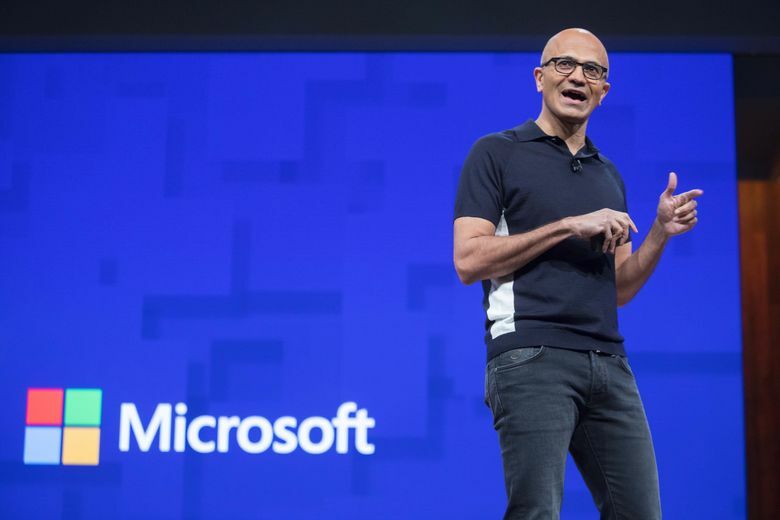 Nadella and Microsoft’s president, Brad Smith, have publicly said they wanted to protect user privacy and establish ethical guidelines for new technology like artificial intelligence. Microsoft declined to comment on Thursday’s petition, but confirmed that Nadella had received the USB stick. The petition was started this month by a coalition of nonprofit organizations calling for immigration reform. A group of Microsoft employees circulated the petition internally, collecting signatures. The group then decided to present Nadella with the petition and use the opportunity to raise their concerns directly with him, said employees involved in Thursday’s encounter. They said they chose that day to present the petition because it coincided with the deadline set by a federal court to reunite children with their parents who had been divided under the former policy.